Tagata Jinja shrine is located on the outskirts of the north of Komaki city. It is unknown in what age the shrine was established, but it is based on a quite ancient indigenous faith. The shrine is dedicated to the hope for prosperity and rich harvests. A very unique and memorable harvest festival “Honen Matsuri” is held by the shrine once a year, and the name “Tagata Jinja” shrine is known throughout the country. 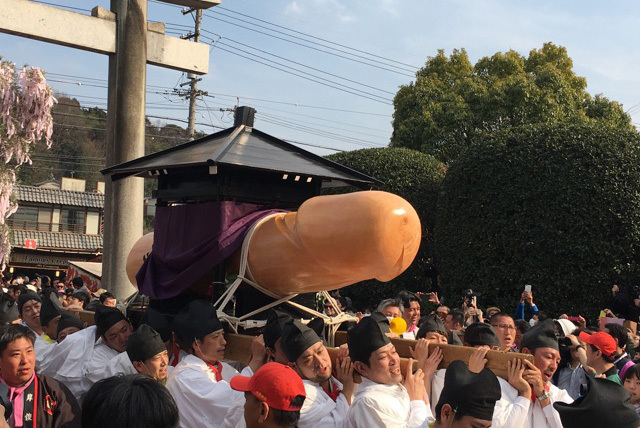 This famous harvest festival is held every March 15 th , where you can see a Mikoshi (portable shrine) in the shape of a male phallus large enough to be seen from several meters away. Many overseas tourists visit the shrine for this festival. There tends to be greater interest from Europeans and North American visitors than Asian tourist.